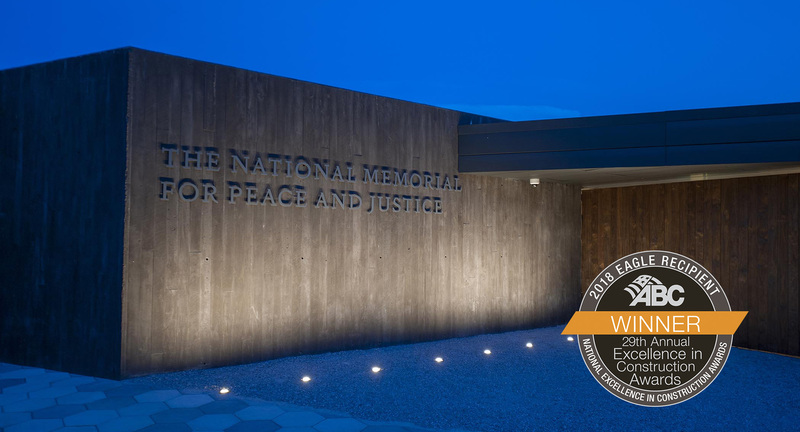 Associated Builders and Contractors (ABC) announced Doster Construction Company as the 2019 National Excellence in Construction Eagle Award winner for the National Memorial for Peace and Justice at the 29th Annual Excellence in Construction Gala on March 27, 2019 in Long Beach, California. On April 26, 2018 the Equal Justice Initiative (EJI) opened the National Memorial for Peace and Justice in downtown Montgomery, Alabama. Doster Construction Company is honored to have partnered with the EJI and to have helped bring their vision to reality. The Memorial for Peace and Justice was conceived with the hope of creating a sober, meaningful site where people can gather and reflect on America’s history of racial inequality. The memorial sits atop 6 and a half acres and includes 20,000 square foot open air memorial with 1,610 corten steel monuments, a monument park and memorial garden. The Excellence in Construction awards program is the industry’s leading competition that honors both general and specialty contractors for innovative and high-quality merit shop construction projects. The award honors all construction team members, including the contractor, owner, architect and engineer. The winning projects, selected from entries submitted from across the nation, were judged on complexity, attractiveness, unique challenges, completion time, workmanship, innovation, safety and cost. A panel of industry experts served as the competition’s judges. This year’s panel included representatives from the Building Owners and Managers Association International, the Smithsonian Facilities Construction Division, the Construction Management Association of America, Engineering News-Record, Design-Build Institute of America and various construction-related firms nationwide. In addition to the national ABC award, Doster also accepted awards from ABC Alabama, ABC of Greater Tennessee, and the AGC of Alabama for their work on the memorial.